The year 2017 was an eventful one for AACF! We celebrated 40 years of working to improve the lives of Arkansas kids and families. AACF observed the occasion in October with our first ever gala, held at Little Rock’s Statehouse Convention Center. During the event, we uplifted outstanding moments in AACF’s four-decade history. We also celebrated our 10 original founders: Betty Bumpers, the late Dr. Bettye Caldwell, the Honorable Hillary Clinton, Mary Sue Jacobs, Pat Lile, the late Dr. Betty Lowe, Jim Miles, Dorothy Nayles, Judge Olly Neal, and the late Sharon Pallone. As we move forward into the next decade, we’ll continue to be the organization our founders intended. We’ll keep providing the leadership, research, and advocacy to promote systemic reforms that improve the lives of all Arkansas kids. Read more about AACF’s history and see a full timeline of our major victories at Aradvocates.org/timeline. Another notable event in 2017 was the retirement of our long-time senior policy analyst Paul Kelly, who spent 22 years of his career at AACF. Paul has been a steadfast advocate for children, particularly those in the juvenile justice system. We are thankful for the work Paul has done at AACF and for his passion and dedication to helping the children and families of this state. He will be missed. This year was also the Regular Session of the 91st General Assembly. While we were concerned about legislation that punishes poor people, there were some good wins for families. The session began with the adoption of Governor Asa Hutchinson’s $50 million low-income tax cut. AACF advocated for a state Earned Income Tax Credit as the cheaper and more effective way to provide tax relief for low-income working families. Yet, we appreciate the Governor’s effort to provide relief for low-income Arkansans. Other wins during the Regular Session included paid maternity leave for state employees; Medicaid expansion approved for another year; a school discipline law designed to keep our youngest kids in the classroom; passage of the Fair Sentencing of Minors Act, which prohibits sentencing youth to life without parole; and an additional $3 million in the budget for our Arkansas Better Chance pre-K program. On the national level, we continue to see one of the most divisive political environments in recent history. This is coupled with a continued attack on the programs that many Arkansans depend on. The new tax law passed by Congress mostly benefits the wealthy and corporations, at the expense of low- and middle-income families. It also increases the deficit and sets the stage for future federal budget cuts. These cuts will hit vulnerable Arkansans even harder. We worked most of the year to ensure that our state’s delegation understood the importance of renewing the Children’s Health Insurance Program (CHIP). This is a major source of funding for the state’s ARKids First program. 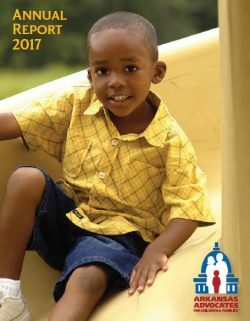 As we move into the next decade, we will continue to advocate on behalf of Arkansas’s most vulnerable children. We have a great staff, a dedicated board, hardworking advocates, and strong partners. Together, we can make kids a top priority in Arkansas.